Posted June 25, 2018 by Paul Swain & filed under Information and Tools. The sun is shining, the days are growing longer and your work trousers have morphed into work shorts in an effort to cool off whilst working on site, all of which can only mean one thing – summer is here. Whilst summer brings a good deal more comfort to working on outdoor sites long into the evening, it also has the unintended effect of making us just that little less careful. Blame it on the heat, but we’re all guilty of being just that little bit less careful when the radio’s blasting and the sun is blaring. All of which makes for an ideal environment for opportunistic thieves, who make use of open van doors to pop in and grab an arm full of whatever they think is most valuable – usually your tools. Van Vault is the most respected brand in mobile tool storage in the world. Launched in 1998 as the UK’s first purpose-built range of mobile security containers, the Van Vault has become a fixture in the nations vans and a ubiquitous helper in the battle against opportunistic criminals. Today, they’re utilised to help protect the tens of millions of pounds worth of tools that are driving around British roads every single day. Along the way, they’ve become a byword for security in the trade storage solutions space. Their range includes the Van Vault 2, with tamper-proof design, 70mm disc lock, 2mm sheet steel construction and four reinforced fitting points, for superior security. 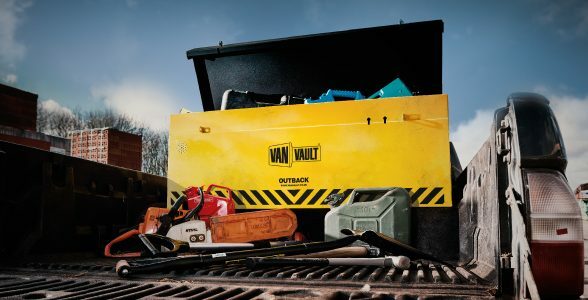 It also features the Van Vault 3, Van Vault XL, Van Vault Stacker, Van Vault Stacker XL, Van Vault Mobi and Van Vault Outback, each with their own dedicated features, to ensure there’s a van vault for everyone. If you need to keep your tools with you, a tool bag is a smart option. Designed specifically to handle the stresses and strains that multiple, heavy and often-sharp tools put on a bag, dedicated tool bags make moving around with your tools as simple as possible. It’s why we stock a huge variety of tool bags, including models from Irwin, OX, Dickie Dyer, Triton, CEL, Facom, Silverline and more. The real power of a tool bag, however, is its versatility. Many of our tool bags are built with over-shoulder straps to help you manoeuvre with both hands in use. Alternatively, models like the Silverline Tool Back Pack Rucksack Bag enable you to move effortlessly from space to space with your tools secured safely. Bags, however, can be stolen, so do make sure that you invest in a high-quality chain and lock to secure it to a near post. Failure to do so can be more than a little foolish. Equally, it’s important to always make sure your tool bag is within your eye line. Although it’s not easy to sneak on to a site and take tools, it is possible and should be guarded against.